Whole Person Coaching® views the client as an integrated whole and through this approach helps them uncover the interrelationship between the various aspects of their life. Using a holistic process, a Whole Person Coach works with the whole person: mental, emotional, physical, social and spiritual, and co-creates with the client within this coaching relationship, which enables to elicit the best from both the client and the coach. The “holistic method is based on the premise that when you come to know, embrace and express all aspects of your whole self, you are positioned to thrive in any aspect of life. 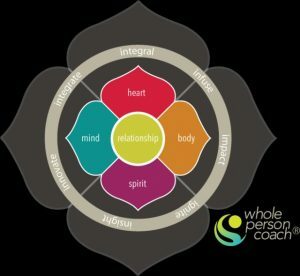 … Whole Person Coaching® focuses on what is possible, creating change by expanding perspectives and possibilities, and by leveraging … client’s natural strengths and resources” (from https://coachtrainingworld.com/about-whole-person-coaching/, where you can find more about Whole Person Coaching®).